"Al fresco" means "in the open air" in Italian, so what better than to enjoy an excellent meal in the open air during the hot summer months? Many luxury villas offer incredible outdoor spaces for reading or family time, no matter where you are going. With a breathtaking view of the surroundings, with incredible decoration or luxurious comfort, you will always find the "al fresco" terrace that suits you. 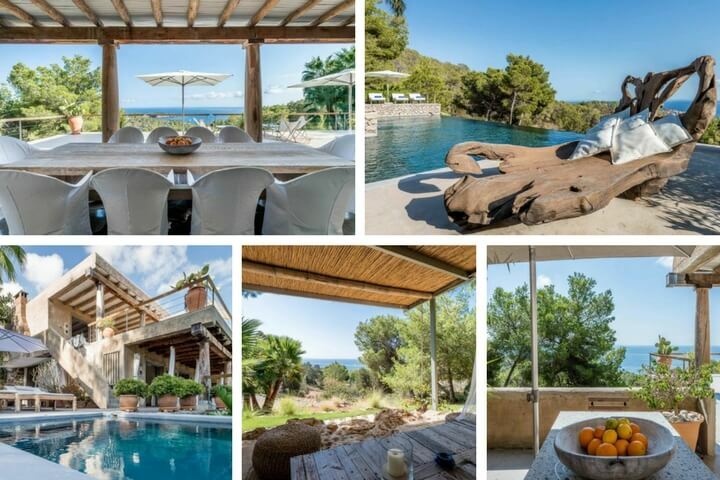 Head to the South of Ibiza to admire this very high-end property which benefits from modern comfort and a breathtaking view. The beautiful infinity pool directly overlooks a breathtaking landscape. The exterior is decorated with great taste and originality, which suggests a stay under the sign of relaxation. In the evening, enjoy the sublime view from your covered terrace that will protect you from the cool winds of late summer. Enjoy an exceptional stay in this modern and bohemian atmosphere. Nestled on the heights of Malaga, Andalusia, this Spanish villa is a real pearl as it shines with charm and luxury. You will have the opportunity to enjoy your breakfasts with views of the city and the beach which are a sublime backdrop. 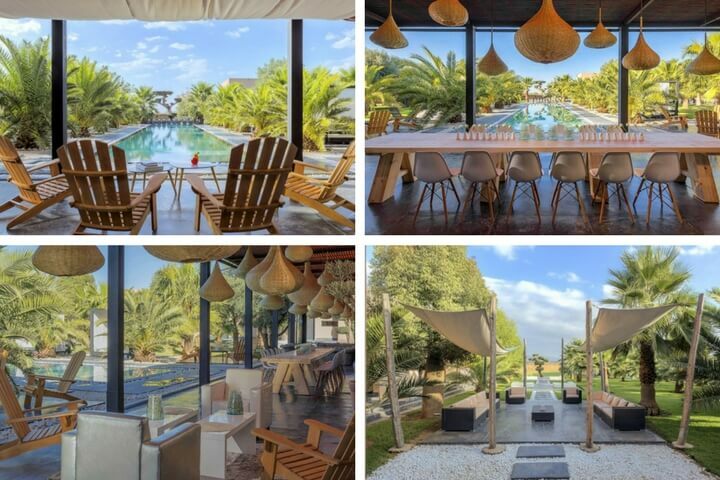 This prestigious house is ideal for small groups of friends or families who want to relax in Spain during their holidays. 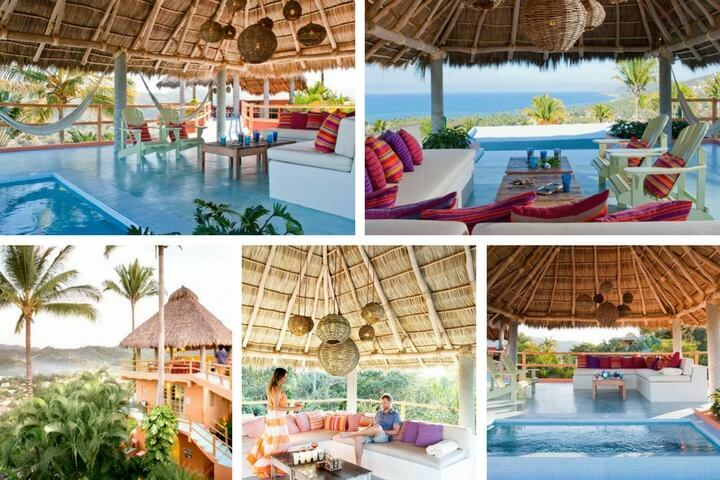 Situated on a hill in the charming tropical town of Sayulita, overlooking the Pacific coast of Mexico, Villa Sayulita is a unique holiday home that is both very well designed and comfortable for families and groups of friends. With its terrace height you can enjoy the jacuzzi, but also the lounge to rest for long afternoons. In the evening, contemplate the stars with your beloved or your family! With its colourful decoration, it's impossible not to feel the positive and joyful waves that emerge from this house. This huge property is the ideal place for large receptions and special events. 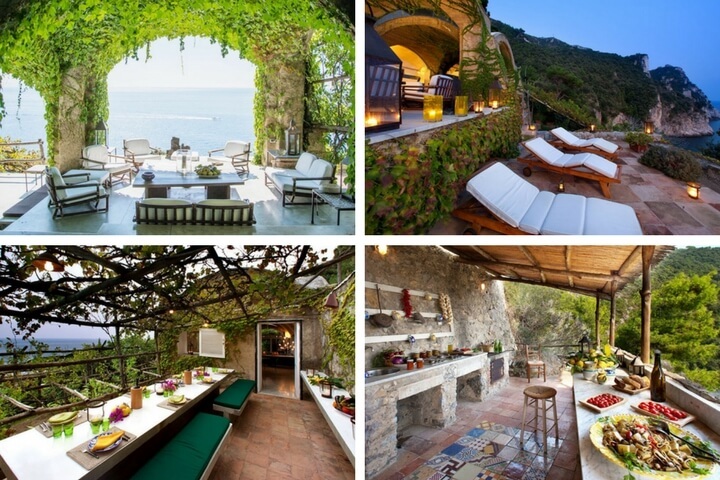 With 17 rooms and a capacity of 48 people, it is obvious that the outdoor spaces are breathtaking. 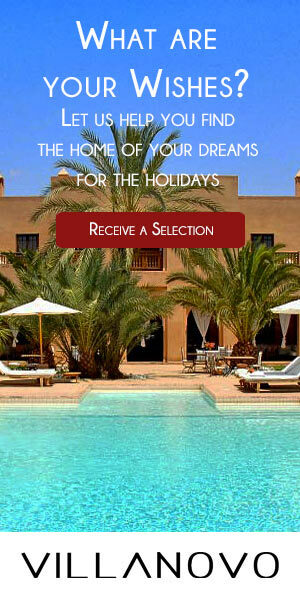 Many lounges line the house, with comfortable sun loungers overlooking the pool lined with palm trees. You will be able to organise meals all together as there is a huge table to enjoy a delicious meal al fresco. With the house staff, there is no need to bother with the worries of everyday life! 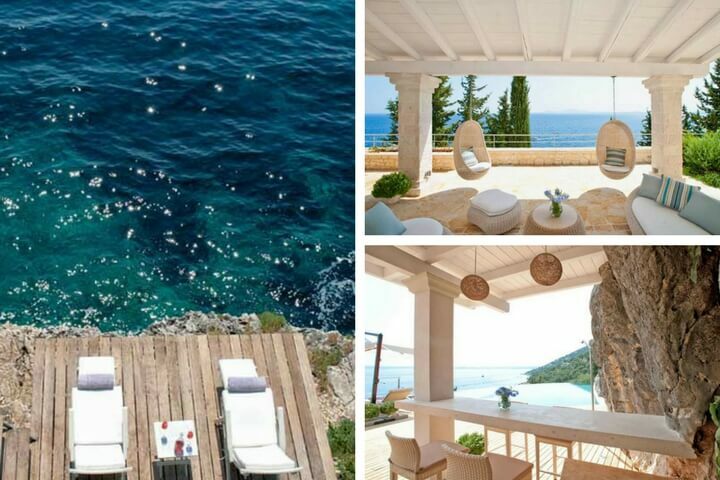 This luxury villa offers a very interesting outdoor area with platforms at the water's edge to perfect your tan and dive into the Ionian Sea. In the shade of trees, you can take your time to read or relax with a cool drink. Finally, under the shelter facing the sea, the outdoor lounge will allow you to meet up with family or friends at the end of the day to enjoy an aperitif or an exquisite dinner. 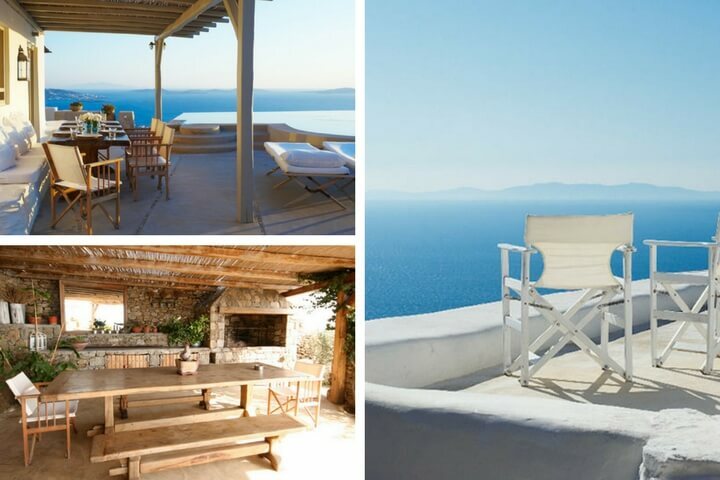 In the heart of Mykonos in the Fanari area, this whitewashed house offers breathtaking views of the island. So, what better than a terrace to dine "al fresco" where you are comfortable to contemplate this magnificent landscape? This is the perfect opportunity to recharge your batteries in front of the infinity of the azure water that lies before you. The must: enjoy an aperitif with friends during the sunset sitting next to the infinity pool with the blazing sun reflected in the water. This luxury home seems to have been gently placed on the side of the cliff, so it offers a 360° panoramic view of the sea that extends to your feet. It is a perfect little hideaway for your family or friends, and the terrace is exquisite, with its kitchen and outdoor lounge. The vines weave a roof to offer you a shaded area during the day, and the pool brings a little freshness, perfect for stays in high season. This divine property in Koh Samui is a real treasure, perched on the heights of Bophut. You can admire the turquoise water in the background, during your dinners on the terrace. Accommodating up to 13 people, this house is ideal for groups of friends wishing to meet for a unique holiday in Thailand. The Saint Regis Villa is the largest and most exclusive private property in Mauritius, a 1,659-square-metre house fully furnished with a capacity of eight adults and four children. Its outdoor bar is the promise of a unique evening with friends to enjoy the end of the day with the setting sun. 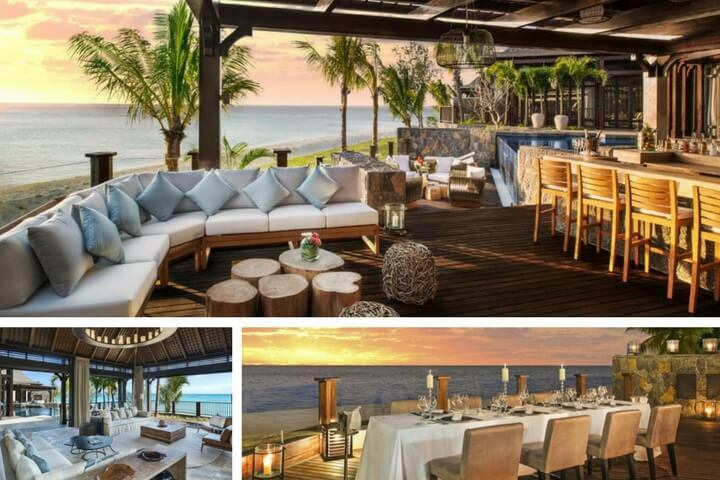 The terrace offers a charming dining area that offers sea views, lit by candlelight. A unique moment that will belong only to you. 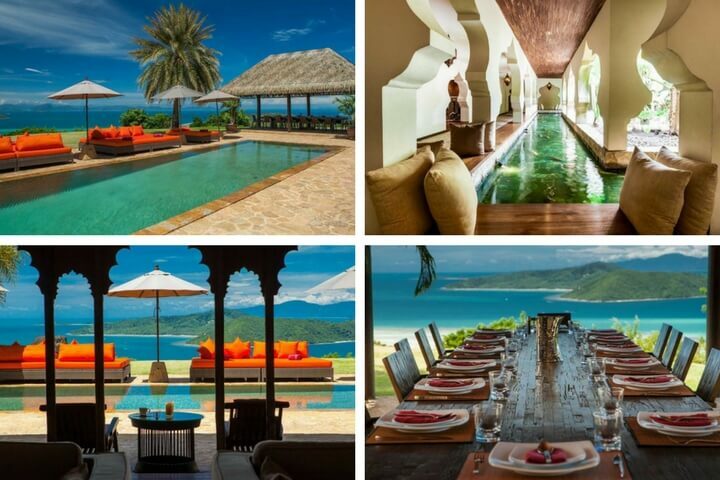 This luxury private villa is nestled on the East coast of Praslin Island. 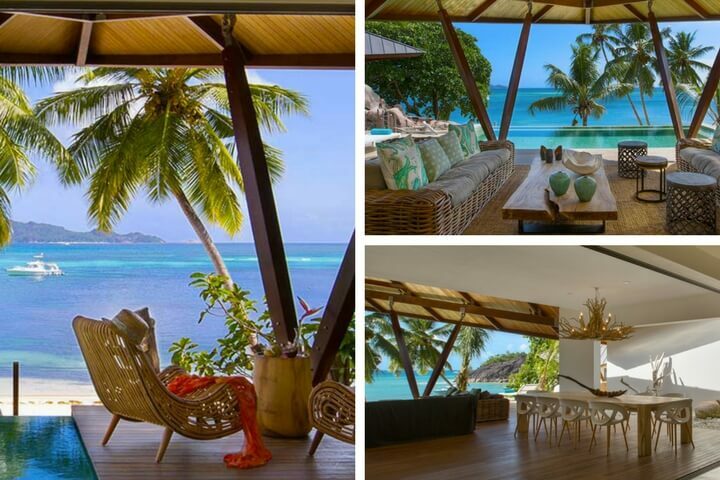 Near Anse Gouvernement beach, among the mythical granite blocks of the Seychelles, this sumptuous property of 5,300 square metres is an oasis of peace and serenity. You can easily imagine yourself in one of the sumptuous armchairs facing the pool. Elegantly decorated, the outdoor lounge is a real little paradise, perfect for relaxation.